Filled, light-cure total-etch adhesive. Simple two-bottle or unidose delivery with only one light-curing step. The one-coat primer and one-coat adhesive can be applied on wet or dry surfaces. Perfect for all direct restorations and for indirect core build-up. 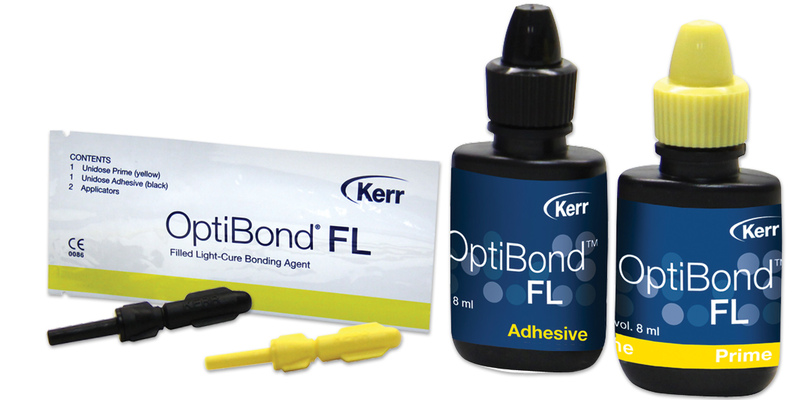 Superior bond strength; virtually eliminates postoperative sensitivity. Contains: 1 x 8ml bottle OptiBond FL Prime, 1 x 8ml bottle OptiBond FL Adhesive, 1 x 3g syringe gel etchant, 10 disposable gel etchant syringe tips, 25 disposable mixing wells, 50 disposable applicators. Contains: 50 Unidose packs. Each pack contains 1 ea: Unidose prime (yellow), Unidose adhesive (black) and applicator. Contains: 4 boxes of 50 applicators ea. Contains: 3 x 3g syringes, 30 bent needle tips. OptiBond FL earned 4.6 stars out of a possible 5.0. Winner of our 20th Anniversary Legacy Award, least technique-sensitive of any adhesive, amazing track record, available in bottles or unidose, works in almost all situations. Not effective when luting a metal-based indirect restoration. With a clinical heritage second to none, it is the safe choice for all but metal-based indirects.